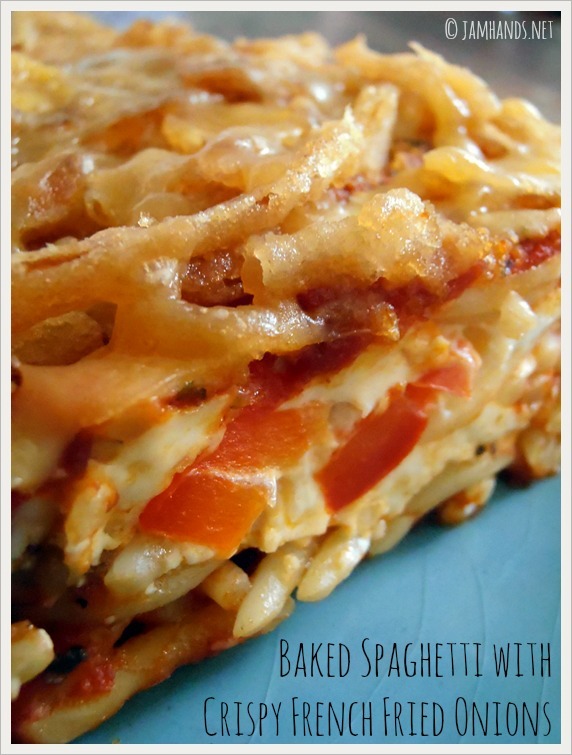 There are many baked spaghetti recipes out there. What got my attention about this recipe from Salad in a Jar was that it has two interesting components. First, a layer of cream cheese and sauteed vegetables which gives it a creamy and delicious flavor. 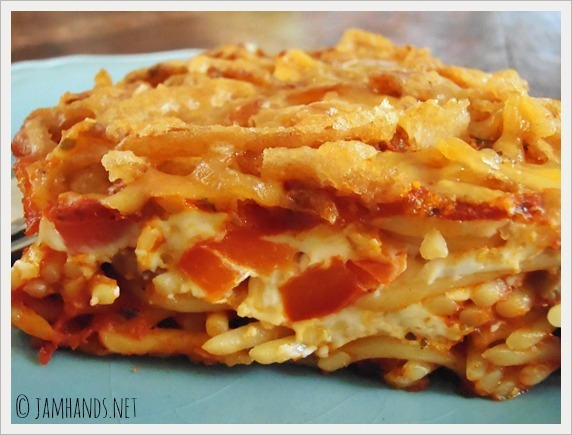 Second, this casserole is topped with French Fried Onions during the last 5 minutes of baking, which adds crunch and flavor. I was a little unsure of how this would turn out, but everyone loved it. Please be sure not to let the onions burn on top. Note: I have also made this casserole using leftover spaghetti which I had made the night before with a meat sauce. I used an extra jar of sauce, plus the leftovers, and it also turned out delicious. Enjoy! 1. Cook spaghetti according to directions on the package. Cook to al dente, drain and set aside. 2. Brown ground beef. Drain excess grease. Add spaghetti sauce to skillet and heat. 3. Combine onions, peppers and butter in a saute pan and cook until softened.